John Wick 2’s trailer has everything we want: bullets, assassins, and a new dog. 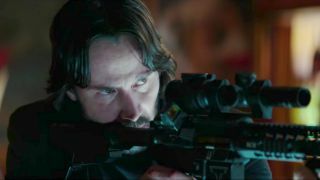 The new teaser trailer for John Wick Chapter Two has just hit, fresh out of the New York Comic Con, and it’s hitting all the buttons: deafening gunfights, shattering mirror-walled rooms, a classical soundtrack, and Rome, the fanciest of cities. With a new dog by his side (rest in peace Daisy), Wick has been enlisted to help a former chum take control of an international assassins’ guild, so we’re in for a visual feast of bullets, fistfights, and impeccably dressed killers (Wick included). Directed by Chad Stahelski and starring Keanu Reeves, Ruby Rose, Ian MacShane, Laurence Fishbourne, and Common, John Wick Chapter 2 will be released on February 10th, 2017. Want to see the latest footage for Underworld: Blood Wars, The Walking Dead Season 7, and Marvel's Iron Fist? You can watch every New York Comic Con trailer right here.